In September, designers and celebrities from all over the world will arrive in New York and London for days of shows, exhibitions and presentations, all dedicated to fashion. It is time for Fashion Week! 9월은 Fashion 의 달이라고 해도 무방하죠! 유명디자이너나 유명인들이 뉴욕, 런던, 파리등에 모여 패션쇼를 열고 즐기는 달로 패션인들에게는 아주 특별한 9월입니다! There are 4 big fashion weeks in the calendar each spring and autumn, and they always take place in this order: New York, London, Milan and Paris. 봄가 가을에는 4개의 큰 Fashion Week 이 있는데요, 보통 이런 패션 쇼나 행사등은 패션의 도시인 뉴욕, 런던, 밀라노, 파리에서 열립니다. Each is known for focusing on different styles. New York is known for more sporty looks, London for edgy, design, Milan for over-the-top and stylish looks, and Paris for haute couture (or high fashion). 또한, 각도시마다 패션 쇼의 캐릭터가 있습니다. 뉴욕은 약간 스포티한 의상을, 런던은 엣지 있는 의상과 디자인을 갖추고 있고, 밀라노는 특이한 디자인의 패션, 파리는 하이패션이 주를 이룹니다. With over 50 catwalk shows featuring work from more than 120 UK designers who are all eager to show off their exciting designs, London Fashion Week is important for anyone with an active interest in style. 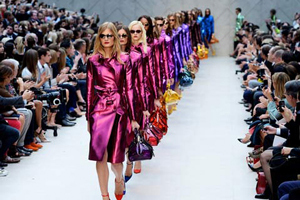 Over £100 million worth of purchases will be made, making London Fashion Week an exhibition that is definitely for people with money to spare! 런던의 유명한 Catwalk show 는 50부문의 패션쇼가 진행되며, 120명의 런던 디자이너들이 그들만의 개성이 담긴 작품을 선보입니다. 패션쇼 동안에 약 100만 파운드의 구매가 이루어 진다고 하는데요, 정말 놀란점이 한두가지가 아니네요! New York’s Fashion Week is the oldest, with the first show happening in 1943, as a way for American designers to show off their work, and to give Paris, a city long-known for its style, some competition. 뉴욕의 Fashion week 는 가장 오래되었다는 점에서 유명합니다. 1943년부터 시행된 뉴욕의 Fashion week 는 미국 디자이너들이 그들의 작품을 보여주기 시작하였고 패션위크의 명성을 다한것으로 유명합니다. In/out of style – As a biannual event that’s attended by a lot of influential people in the style world, London Fashion Week will determine the hottest upcoming trends (IN style) and what is now no longer deemed cool (OUT of style). Be prepared to hear these a lot! In/out of style - Fashion week 는 연2회 행사로 많은 패션인들에게 영향을 주고 있습니다. 런던의 Fashion week 에서는 새로운 스타일과 hot 한 스타일을 IN Style 이라고 칭하며, 유행이 지나가는 스타일을 Out of style 이라고 칭합니다. 여러분 In-style 의 준비가 되셨나요?! Faux pas – Originally from French, and relevant to a lot of situations outside of the world of fashion, this helps describe a situation where someone has made an embarrassing style mistake and not dressed well. Wearing socks with sandals is a famous fashion faux pas. Faux pas - 우리발음으로 하면 포우파 라고 하죠. 이 언어는 프랑스에서 유래되었고 패션피플들에게 많이 오르락 내리락 하는 단어입니다. 어떤 경우에 쓰는지 알고 싶나요? 보통 패션피플들이 촌스러운 옷을 입은 사람이나 스타일이 없는 옷들을 보았을때 패션 피플들은 포우파 라고 합니다. 예를들어 양말을 신고 샌들을 착용할경우 영낙없이 포우파 소리를 듣겠죠? Dress to kill – To dress up in strikingly attractive clothes. Everyone attending Fashion Week will be hoping to outdo one another with their choice of clothing, so expect to see a lot of people making a big effort to dress to their best. Fashion victim – Someone who is obsessed with following every fashionfad, to an extreme extent. Sadly, fashion is a very expensive hobby to have, and someone who spends a ridiculous amount of their money on style fads is likely to be looked down on as a slave to fashion. With its wide variety of styles and big names on show, Fashion Week is the dream event for all fashion victims. Fashion victim - 우리도 Fashion victim 이라는 말을 종종 쓰죠? 유행에 따르려고 엄청난 가격을 주고 시도하였는데 어울리지 않은 사람들을 보고 종종 말하는 단어 입니다. 정말 안타까운 상황이 되겠죠? !